I have received an offer of admission. What should I do now? Congratulations on receiving an offer! The Admissions Committee looks forward to you joining us at McGill. Once you receive your offer of admission, read your admission letter and the information on McGill's Graduate and Postdoctoral Studies website carefully. You will also receive an electronic package from the Faculty of Law. To officially accept an offer of admission from McGill, you must pay the confirmation deposit via your uApply account. You will also be required, by the beginning of May of the academic year in which you applied, to submit a completed confirmation form where you attest that you have withdrawn all other applications and will refuse all other offers. Failure to submit this form in time will result in withdrawal from the program. You will need to provide legal documents that affect your tuition and registration status. If McGill does not have proof of residency documents, you will be charged international student tuition fees. Consult McGill Enrolment Services' Legal Documents page for complete details. I've accepted the offer of admission! What's next? All incoming graduate students must attend a group advising session prior to the start of the fall semester. As the fall semester generally starts at the beginning of September, we expect you to be on campus for orientation during the last week of August. While you must be at McGill during Orientation Week, you may wish to arrive earlier in order to settle into your new home and city. Prior to your departure for Montreal, international students are strongly encouraged to consult International Student Services' Pre-Arrival Guide. You must register for your courses through McGill's online registration system (Minerva) prior to your arrival at McGill. You will receive additional information from the Faculty of Law via email in June. Orientation activities, primarily planned the week prior to the start of classes, allow you to meet your colleagues and to explore your new academic home. Visit our Orientation page for additional details. 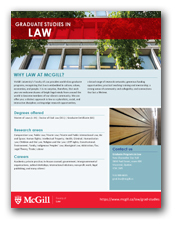 For any questions, please contact us at grad.law [at] mcgill.ca. We look forward to meeting you in September! Watch the Facebook Live event with Associate Dean Richard Gold! Submit your application for admission to our graduate programs by December 15.